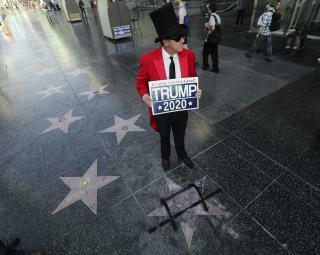 (Newser) – Vandalism has once again hit President Trump's star on the Hollywood Walk of Fame. 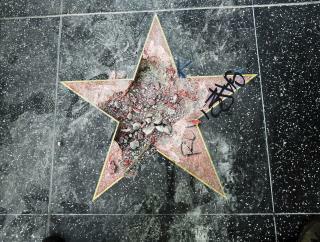 This time, a man who had a pickax hidden in a guitar case almost completely destroyed the star, reducing it to mostly rubble, NBC Los Angeles reports. The suspect left the pickax at the star and reported the incident to police himself, around 3:30am Wednesday, and later turned himself in. 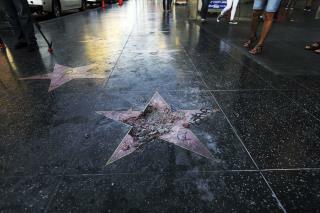 Graffiti was later added to the already-destroyed star, CBS Los Angeles reports. And left the kevin Spacey and Bill Cosby stars alone. that are right next to it.. IRONIC.